According to recent report, the number of employees using formal flexible working arrangements (such as part-time working, term-time working, compressed hours and job sharing) has flat lined since 2010. This is despite the right to request flexible working being extended to all employees by law in 2014. The report, commissioned by the CIPD, is part of a wider campaign backed by businesses and Government departments to get more businesses to offer flexible working practices. Whilst this is great news in principle for employees, how can business owners offer flexible working without it impacting on their bottom line? Consult with staff to understand what they would like in an ideal situation (flexible hours, early finishes or working from home arrangements?) A staff survey is a quick way to do this and understand what the different requirements are within your business. Look at the job roles and analyse them in line with peak times for your business to help you to understand where you could allow flexibility with hours. Establish core hours / days – where key staff are working so that your business is not left short or under-staffed. Communicate changes and rules to staff clearly so that they understand what is expected of them and what will not be tolerated. Consider a trial run – where changes are implemented and analysed. Gather feedback from staff and adapt, make changes as you go along. Consult with staff (again) – run another survey at the end of the trial period to see how staff have responded. This will allow you to reflect and refine your policy. Get in touch to discuss any queries you have about flexible working or read our guide on staff surveys. 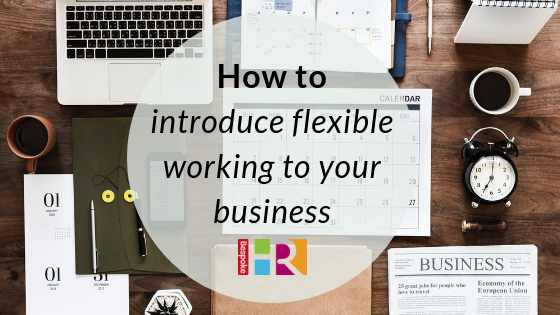 We would happy to share our own experiences of running a flexible working business.